"Confederate Soldiers' Memorial, Brooksville, FL" by George Lansing Taylor Jr.
Confederate Soldiers' Memorial , Brooksville, Fl. This statue is a sculpture made of stone, which was dedicated on June 3, 1916. It is a standing figure of a uniformed Confederate soldier. He leans on his rifle which he holds in both hands in front of him. 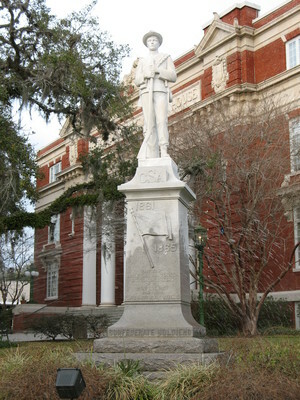 It is located at the County Courthouse in Brooksville.
" This monument perpetuates the memory of our fallen heroes--We care not whence they came; wether unknown or known to fame; their cause and country still the same; they died and were the gray--leaving to posterity, a glorious heritage--an imperishable record of dauntless valor." Taylor, George Lansing, Jr.; Lance Taylor; Photographers -- Florida --Jacksonville; Photograph collections -- Florida -- Jacksonville; Confederate Soldiers' Memorial; Confederate Soldier; Statue; Confederate States of America; Hernando County (Fl. ); Brooksville (Fl. ); U. S. Memorials --- Florida --- Brooksville.